Artist Beware: Onnanoko - "Artists Beware"
At Further Confusion 2017 in San Jose, my mate Zaelgolin and I were doing the rounds in the Dealer's Room on January 13, 2017 before coming across the table of Onnanoko who was dealing at the convention. My mate Zaelgolin had previously gotten a badge from this artist a year before through an FA commission and liked it a lot, so he recommended I get one as well. I agreed, and requested a half-body double-sided digital badge of my dragon character Sabre. 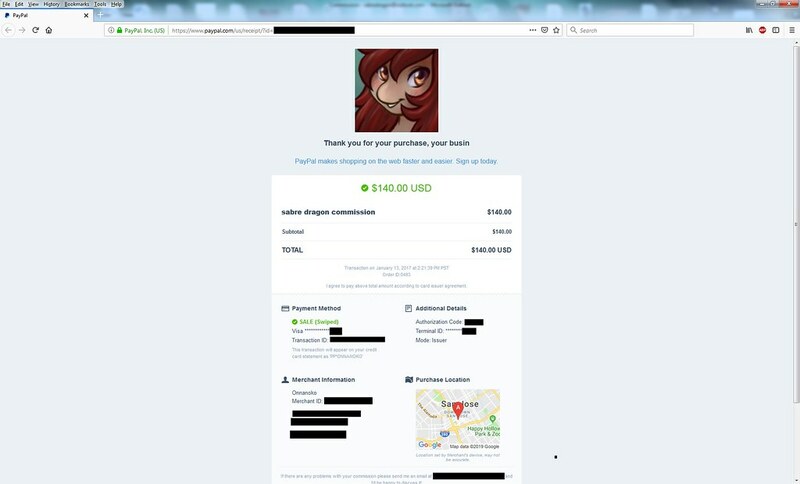 Onnanoko quoted the price as being ($140.00 USD), which I agreed to, and paid for at her table using Paypal using a Square reader extension on her cellphone. I mentioned that I did not know exactly what I wanted at the time of purchase, and asked if I was able to view her FA gallery once I got home from the con to try to formulate my idea. Onnanoko said this was OK, and recommended I contact her on Telegram once I was ready. I grabbed a business card from her, saw the Paypal receipt come through on my iPhone mail, and I was on my way. Here is a picture of the business card I have from Onnanoko placed with original items I am the only owner of (artist's email address redacted). 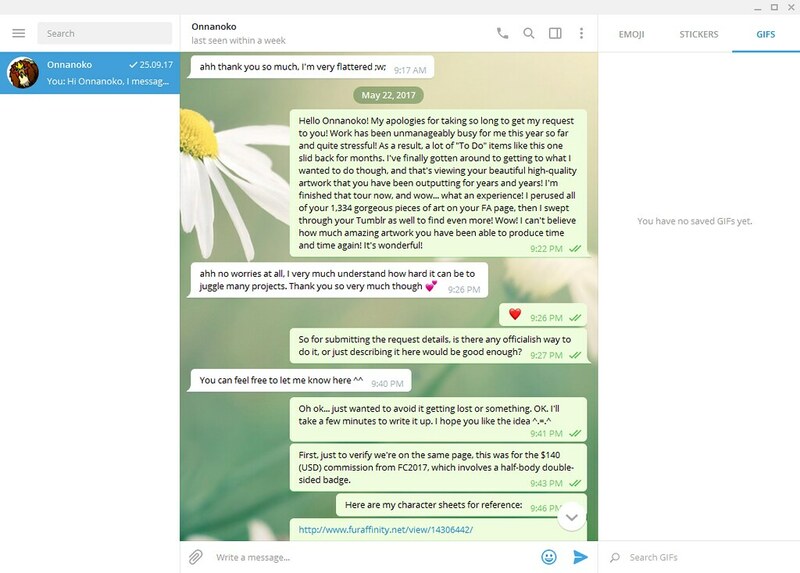 On March 9th, 2017, I first established contact with Onnanoko on Telegram after creating a Telegram account and installing the desktop program. I confirmed the purchase details and explained that I would like to view all her posted art first while I thought of an idea, which she was OK with. 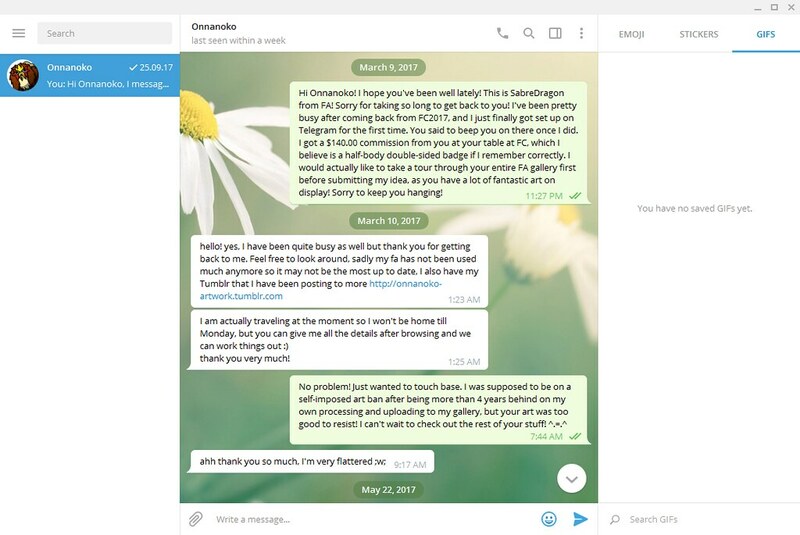 On May 22nd, 2017, I re-established contact with Onnanoko on Telegram after viewing all of her posted art on FA and really enjoying it. The conversation with friendly and cordial, but unfortunately this would be the last time she would ever contact me (unbeknownst to me). There was a lot of friendly chit-chat about her artwork that I was complimenting in the middle of this conversation, so I have only supplied the beginning and end of the conversation in my screenshots. This is where I officially provided my detailed request. In all fairness, since I took a while to do this, I consider the clock starting from May 22, 2017, and not January 13, 2017 when my payment was made. This was just due to me being busy with work, life, and other things. I was in no rush to get the commission and was willing to wait patiently. 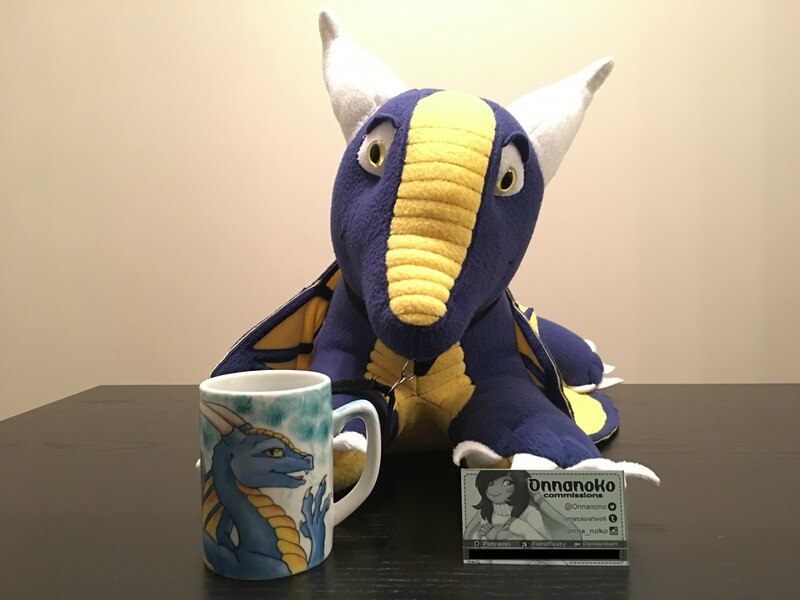 Onnanoko explained that she would be busy with BLFC2017 upcoming, and to contact her after the convention sometime. 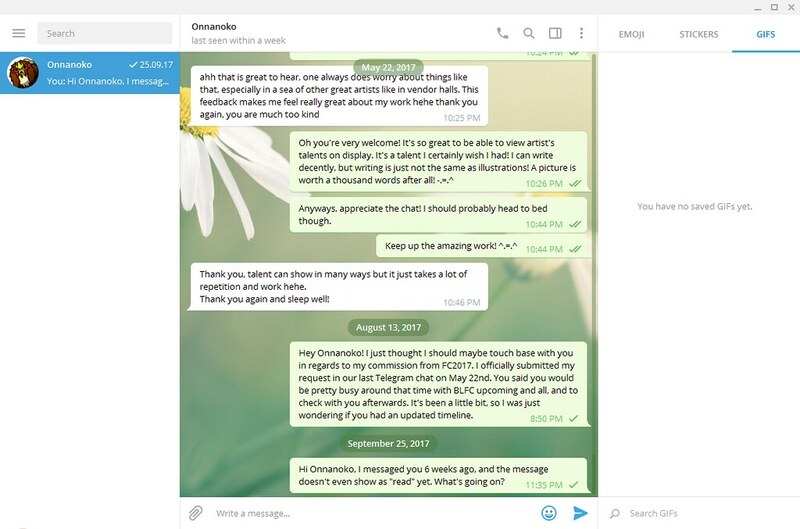 On August 13, 2017, I sent Onnanoko another message on Telegram asking for a friendly timeline update. Unlike my last message, Onnanoko never read the message and no response was ever received. 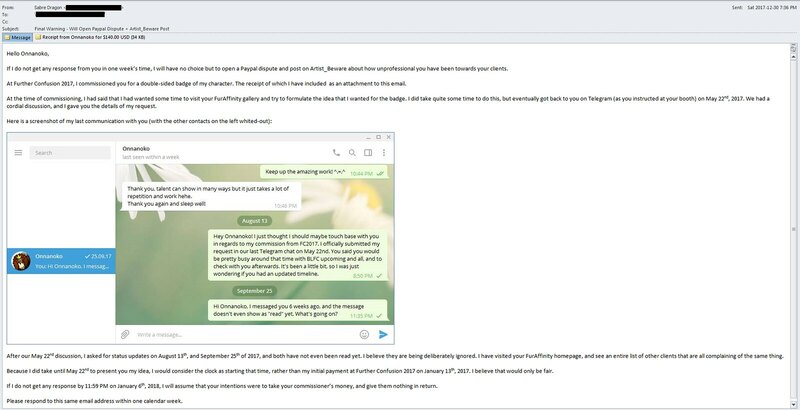 On September 25, 2017, I sent Onnanoko another message on Telegram after not hearing anything for 6 weeks. Again, Onnanoko never read the message and no response was ever received. On December 30, 2017, I had visited Onnanoko's FA page again and noticed that several previous commissioners all had posted "Shouts" on her page all asking for status updates from years prior, as they were not getting any communication back from her despite having their commissions paid-in-full. I then sent Onnanoko an email to her posted Commissions/Paypal email on her FA page stating with the final warning that I intend to open a Artist Beware post and Paypal Dispute if I do not receive some type of response within 1 week. A week came and passed with no response given. This was really disappointing, as I really did not want to have to resort to going through with this. This is likely the reason why I took an extra 363 days to follow through on my threat, because I really didn't want to have to go through the effort to do so, as well as all the negativity surrounding it. However, with Further Confusion 2019 less than 2 weeks away, I felt it was my moral obligation to warn others about the risk of giving this artist any money. Admittedly, I did not yet perform the official Paypal dispute that I threatened to do in my final email. This I feel is a bit drastic, and I would first like to try the Artist_Beware route in the search for a resolution. 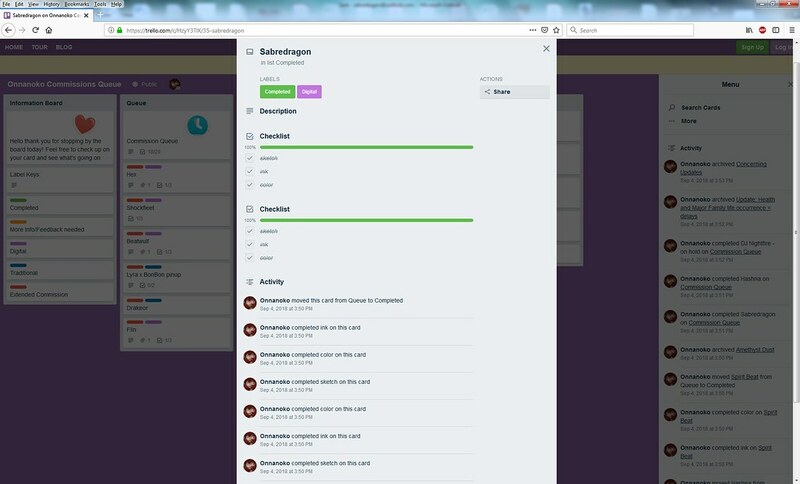 On September 4, 2018, Onnanoko updated her Trello page and fraudulently claimed my commission was finished by moving my commission from a "Queue" status to "Completed" status. It was actually a friend of mine that first noticed the status change, and asked me if they could see what she did. The truth is that I received no contact of any sort from Onnanoko since May 22, 2017. The fact that Onnanoko was starting to fabricate work completions that were never even started was particularly disturbing. And today, January 5, 2019, I finally followed through on my Artist_Beware posting, just 1-day short of a full calendar year after my communicated deadline. The artist has ruined the working relationship with me so much that a full refund of the ($140.00 USD) I paid her is the only resolution I will accept at this point. It seems your not the only one who is waiting for a commissions from her shout page. I imagine her total list of owed commissions is colossal. I'm sure she would have let me do whatever I wanted, as her intention from the beginning was to take my money and give me nothing in return. These bad apples are going to ruin it for other honest artists such as yourself! You are at the top of my list of favorite artists because your art quality and customer service skills are equally fantastic! I commissioned Onnanoko for a $40 headshot badge at Rocky Mountain Fur Con 2016, which I immediately paid for in full. I gave her my contact information, which I saw her write down. But, I never heard from her again after that. I have emailed her and left shouts on her FA page, still nothing over 2 years later. I never once saw my commission appear anywhere on her Trello either. Sadly I paid for the badge in cash so I can't open a PayPal dispute. Even though quite some time has passed, I would still encourage you to make your own official post under "artist-onnanoko, beware" so that people can see how many unresolved disputes this dishonest artist has.